If in the past coconut oil was only seen in one eye, now many people are crazy about coconut oil! Why? Because there are so many benefits that can be obtained from this one oil. Starting from health to beauty! Not only that, the price is relatively cheap and easily available anywhere. So it's no wonder why coconut oil is now a prima donna! Well, today I will discuss what are the benefits of coconut oil that we can get from everyday use! Coconut oil contains vitamin E which is very good for the skin. It is able to absorb into the skin so that the moisture of the skin is maintained inward. This is proven when I use coconut oil as a cream for the last few weeks. In the morning, the skin feels moist and supple! Now, even though coconut oil contains fat, but the fat contained is a type of fat that can accelerate the body's metabolism. 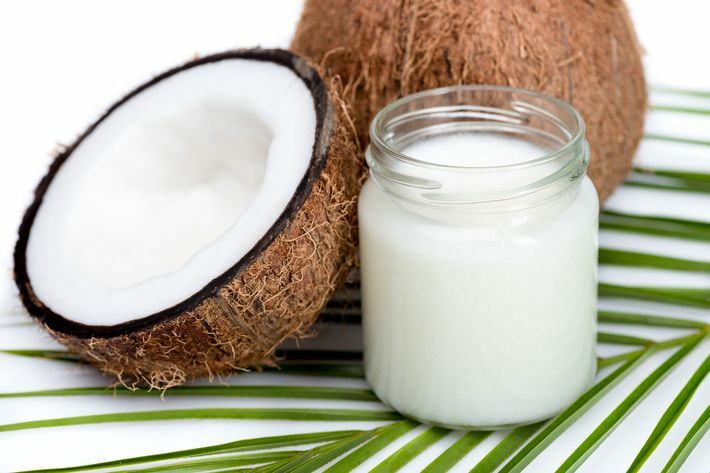 The good thing is, the fat that is eroded by coconut oil is usually fat that accumulates around the stomach. Wow, it's worth trying like this! If you are running out of make up remover, you don't have to bother anymore to buy it at the nearest store. You see, you can use coconut oil instead! Coconut oil contains substances that can remove a variety of make-up water resistant, such as mascara or eyeliner. How to use it is easy, just drop the coconut oil into cotton and then wipe it into the part of the skin that you want to clean. Coconut oil contains one type of fat that helps digestion become smoother, so you don't experience constipation or constipation. This is also evident when my new child MPASI has constipation. When I give it 1 teaspoon of coconut oil, a few hours after that he can defecate smoothly! When I was in America a few years ago, there was an oil pulling trend. This is a method of rinsing your mouth using coconut oil every time you wake up early for 10-15 minutes, then spit out the rest of the coconut oil. Well, this oil pulling is believed to be able to help whiten teeth and prevent cavities. If I see from some bloggers who have implemented it, it seems effective, huh! I myself once tried to do it, but unfortunately it only lasted a few days. I can't stand having to store oil for up to 10 minutes in my mouth! I feel like throwing up! But if you don't feel bothered by something like that, go for it! As humans, it is only natural that we experience stress occasionally. But if stress is approaching, don't let it go! Try to tell the closest person and don't forget to do fun activities. Apparently, coconut oil can help relieve stress because the scent reminds us of the beach and is also calming. You can put a few drops of coconut oil on your head, then gently massage. Guaranteed the burden is reduced as soon as you do it! Lauric acid is only contained in ASI and coconut oil. This substance has a lot of good content, one of which is helping the body to fight infections that occur due to bacteria. Some diseases that can be helped by coconut oil are influenza, hepatitis C, to AIDS! Reading so many benefits from coconut oil, it seems obligatory to start using coconut oil in everyday life. The price is relatively affordable also makes this oil easily obtained by every household in Indonesia. Oh yes, a little advice from me, if you choose coconut oil, make sure to choose the pure one without any mixture, huh! Usually the label will be written VCO or virgin coconut oil, because coconut oil does not contain other ingredients. Okay, please look for coconut oil and get the benefits!